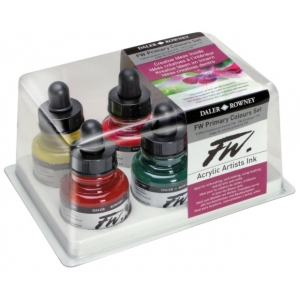 Acrylic-based inks are water-soluble when wet but dry to a water-resistant film on most surfaces. * All colors are very to extremely lightfast. 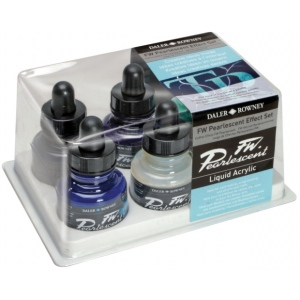 * The best means of applying pearlescent colors is by using a dipper pen ruling pen or brush. 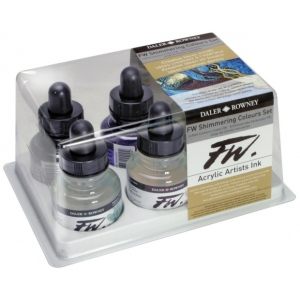 * Due to large pigment particles these are not suitable for fine line nozzles for airbrushes technical pens or fountain pens. * All colors are intermixable permanent and translucent with shimmering pearlescent effects. * Use on paper board wood and leather. * 6-color set 1 oz bottles.